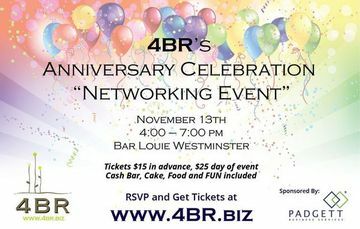 Less than 8 hours before ticket prices increase for tomorrow's Anniversary Celebration Networking Event.&nbsp; Already over 125 RSVP's, $1,000 in Door Prizes, Delicious Food, Out of this World Cake and an AMAZING SPONSOR - Padgett Business Services - where they help your business GROW! Bring a friend!&nbsp; See you there!!! Colorado Real Estate Investor's­ Association (Colorado REIA)!